3 Ingredient Cake Mix Cookies are soft and chewy and super delicious! Made with the batter from your favorite box of cake mix these cookies are so easy to make and will be ready in just a few minutes. These cookies made from cake batter is one of my favorite recipes because they are so simple to make. Some of my other favorite easy dessert recipes are these Homemade Brownies, Jello Cookies and Chocolate Chip Cookies. Have you ever made cookies from a box of cake mix? Not only do they taste amazing, they are super simple to make and only require 3 ingredients! Making them is essentially a no-fuss, fantastic treat. 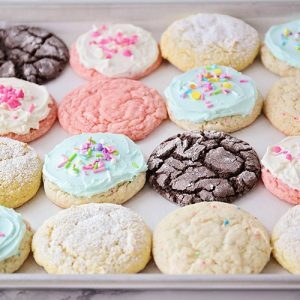 Take a look at our video below and see for yourself just how easy it is to make these cookies from a box of cake mix. I’m not sure who came up with this brilliant idea but ever since I found out about it, I was hooked! What I love most about this recipe, is that you don’t need any fancy ingredients to make them. Just grab these simple ingredients that I’m sure you already have in your house and get backing! First, grab your three ingredients – cake mix (any flavor), eggs and oil. Dump all the ingredients into a mixing bowl and stir with a spatula until combined. Your cookie dough should be firm, but sticky. Next, place the cookie dough on a cookie sheet. I like to use a small ice cream scoop to measure the amount of dough for each cookie. This way they’re all about the same size and they should cook evenly. Once they’re on the cookie sheet, bake in the oven for 7-9 minutes. I usually bake them on top of parchment paper or a silicone baking mat to make cleaning up even easier. If the bottom of your cookies are burning before they are fully cooked, try moving your cookie sheet one level higher in the oven. If that doesn’t work, consider purchasing a new cookie sheet. As cookie sheets get old, the bottom of your cookies will tend to cook faster than they should. Pull them out of the oven when they are tall and gooey, but starting to brown on the edges. Leave them on the baking sheet while they cool to continue baking a bit. Once they have cooled enough to handle them, it’s time to decorate! 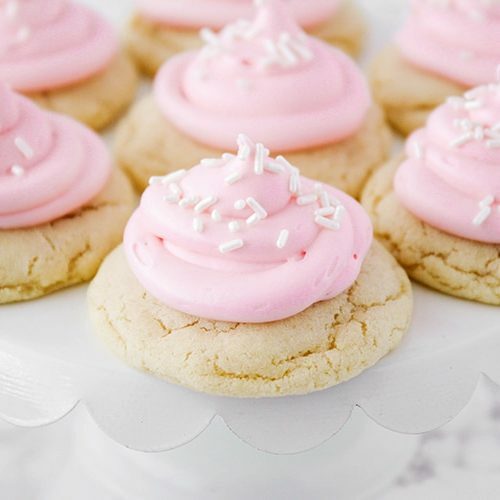 There are so many ways to dress up these easy cookies made from cake mix. Here are a few more flavor ideas that I’ve tried out and absolutely loved! I love how versatile and endless the possibilities are with these cookies. In very little time you can have a full spread of cookies to serve without having to spend a lot of time in the kitchen. I love how these strawberry cookies turned out! 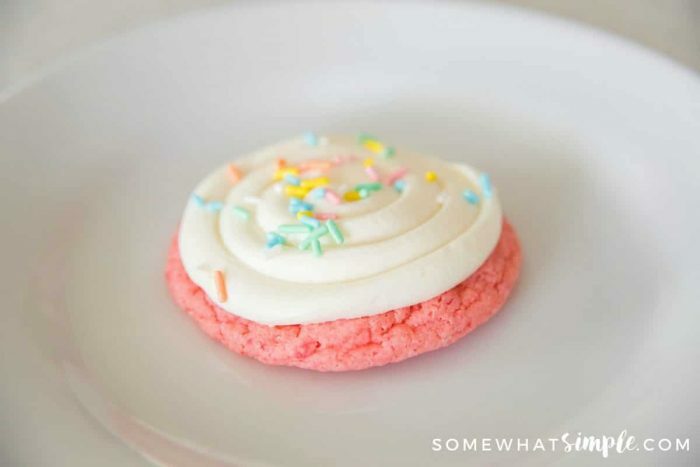 I love the bright color of the cookie with pastel colored sprinkles. Just looking at it puts a smile on my face! Once you’ve baked them according to above directions, then sprinkle with powder sugar, or frost and add sprinkles! I don’t know about you but I am chocolate’s biggest fan! I don’t know what it is but every time I wake up from a nap, I have a craving for chocolate! Usually I’ll just whip together a batch of these cookies because they’re so easy to make. One quick tip before baking, roll the balls of chocolate dough into some powdered sugar. You can do this for any flavor but I just love the combination of chocolate and powdered sugar. Once you’ve done that, bake according to above directions. 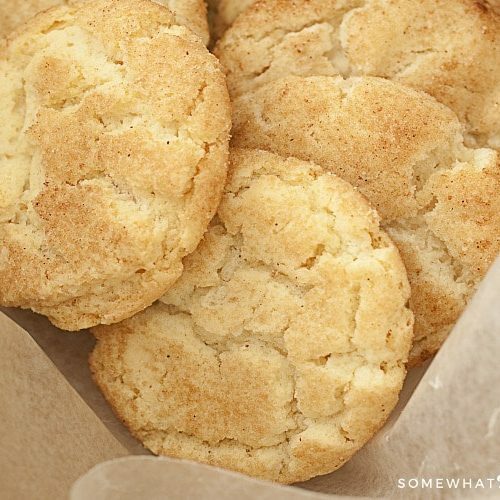 I love to make these lemon cookies in the summertime. I just love the zesty flavor contrasting with the sweetness of powdered sugar sprinkled over the top of them. For these I just baked them according to above directions, then sprinkle with powdered sugar once they cool completely. There are so many other options to choose from, you’ll never run out of options. I can’t wait to make more of these with little pieces of candy mixed into them. 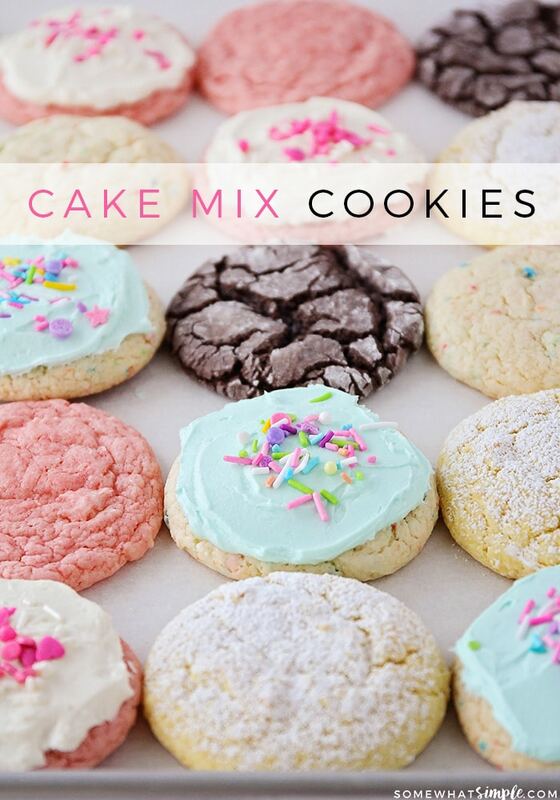 What are some of your favorite cake mix cookie recipes or variations? Leave us a comment below and let us know. I can’t wait to hear your ideas! Once you’ve had a chance to make these easy cookies, leave me a comment below and let me know what your favorite flavor was. I can’t wait to hear how they turned out! 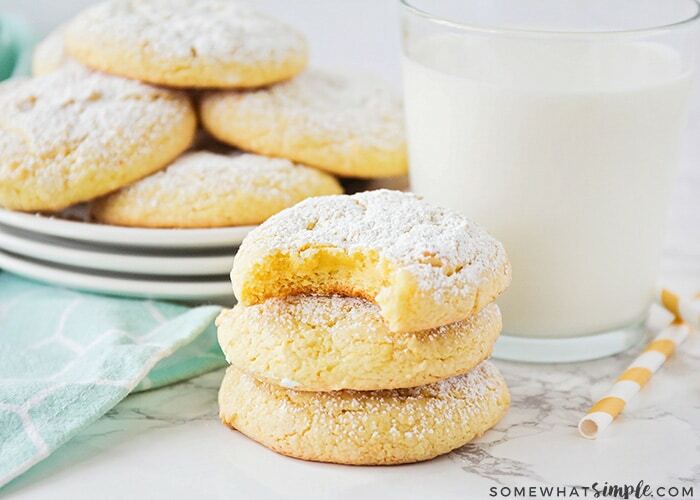 3 Ingredient Cake Mix Cookies are soft and chewy and super delicious! 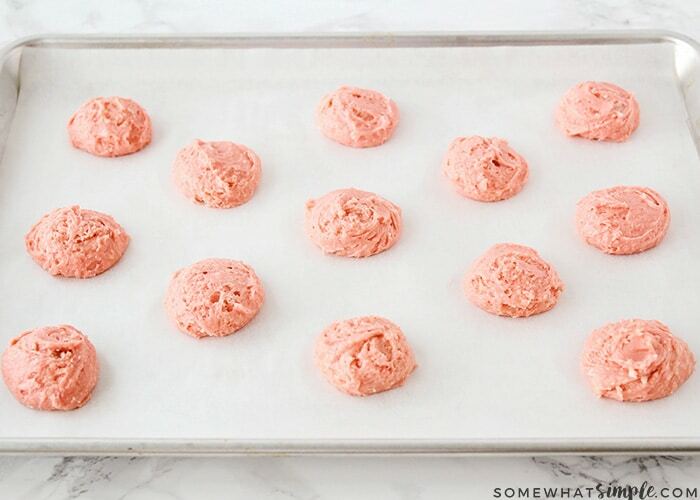 Roll cookies into golf-ball sized balls and place them onto cookie sheet. Cook for 7-9 minutes or until the edges start to brown. Cool completely, then add frosting and sprinkles, or dust with powdered sugar. 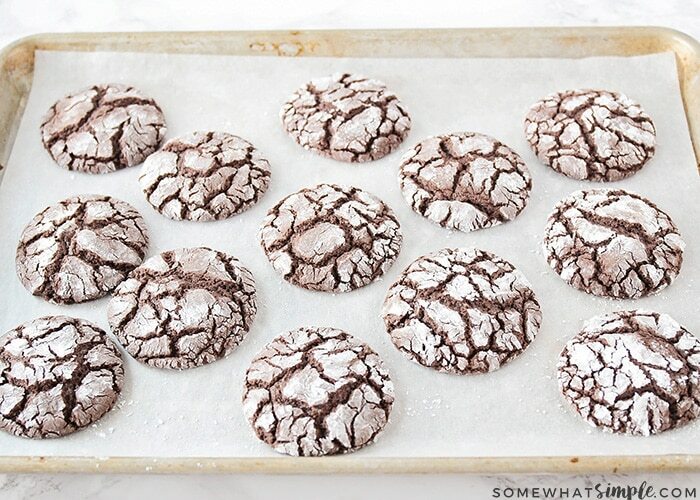 For chocolate cake mix cookies, roll your balls of dough through a pile of powdered sugar before baking. My wife and cake mix cookies for a Prison Ministry called KAIROS. They are always a hit. No need to decorate (it’s not permitted anyway). Bake them on parchment paper. Slide the sheet off, let completely cool. Slip another parchment on the pan and load it up. Look for sales in cake mix and eggs and you have inexpensive tasty cookies and a variety. makes for a delicious colorful tray display. My wife enjoyed hearing RESIDENTS at the CLOSING ceremony call out. “IT’S THE COOKIE LADY”. I’m glad you loved them! Thanks for sharing! i want to make white cake mix cookies but it says on the cake recipe to use egg whites. does that matter when making the cookies? should i just use the whole eggs. I’ve never had a box of cake mix that only required egg whites before. However, I believe they do this for white cakes because it keeps the cake from having a yellow tint to it, so I don’t think it will matter if you use the whole egg. Cake mix cookies are one of my go-to’s! Seriously couldn’t be easier! Cake mix cookies are some of my faves. The texture is amazing. Love these so much. My mom used to make these cookies but I could never find the recipe Thanks for sharing. I love easy and these look easy. Can’t wait to try. I love these cookies, they couldn’t be any easier. Thanks for sharing! These are our favorite. So easy and yummy! Easy & so delicious!! These cookies are always a hit! I try to make sure I always have these ingredients on hand, so I can whip these up anytime! THese are the cutest yummiest cookies! We love them and how easy they are to make! I love how easy these cookie are to make and that there is so much variety available. Made these for Christmas out of a random yellow cake mix box we had in our pantry. I mixed in a full bottle of peppermint sprinkles. They turned pink instead of red but they were delicious and soft. My 6 year old nephew voted them his favorite. I’m so glad you loved them! These are my favorites too! Hi, your video says to bake at 350, but the direction says at 375. Which is it? Thank you! Sorry, I misspoke in the video, it should be 375 degrees. This is such a fun, easy, recipe. I made chocolate chip . I used Betty Crocker Super Moist Butter Recipe, 1/3 C coconut oil, 2 eggs mixed all together then, added 3 handfuls of simi-sweet chocolate chips, rolled each ball in powdered sugar, cooked on 325 convection 14 minutes. I let them cool on the cookie sheet. They were perfect! I’m so glad you like them!!! Thanks for stoping by! I did this with the Betty Crocker super moist Spice cake. I used melted coconut oil, about half of the amount of oil you recommended, and it was perfect. The were delicious, and so soft. Topped with some vanilla marshmallow frosting and these were so good. Basically little cake cookies ? I’ve been making theses cake box cookies (choc) every year with my Christmas cookies. I love them, but they get hard as rocks very quickly. How do you store them? My kids usually eat them all within minutes:) but if there are any left over, I’ll put them in a large Ziploc bag and leave them on the counter or in the fridge. Hi, I find that these turn out great – soft & flavourful. However, the tops usually are very wet which makes it hard to pack them up. Do you have any suggestions for storing/freezing? I have tried waiting until they are 100% cool, then layering in wax paper but they still are sticky! Can you make this cookie dough and freeze it for later? Will they be as good? I’ve never frozen the dough before but if you try it, let me know how it turns out. Quick and easy recipe. I dip them half in melting chocolate. Oh so yummy. That is one of my favorite variations! YUM!!!! Can these be frozen to use later? Tried this using Pillsbury “Purely Simple” white cake mix. Used half of the oil because i melted 1/3 bag of butterscotch chips thinned with heavy cream and buttermilk then thickened the batter up with 1/4c steel oats (which i ground in the coffee grinder) and added white chips. Need to amp up the flavor a bit more but the cookie itself was a great texture. Thanks! I have two boxes of lemon cake mix and these are going to be great on my Easter dessert table! I used a lemon cake mix and added a cup of Rice Krispie cereal. I warmed up a couple of tablespoons of store bought lemon frosting in the microwave and drizzled it on the cooled cookies. Delicious! Hmmm…. I am trying to remember if I have ever tried red velvet cake mix. I have tried SO many varieties, and I feel like I’ve tried the red velvet with powdered sugar, but now your comment has me wondering and I can’t be certain. 🙁 Sorry they didn’t turn out – that is always so frustrating!!!!! I’m so excited to try! I was going to make my mom a cake for her birthday. But I found our she likes cookies way better. Thank you! I tried this for the first time this weekend. I used white cake mix, eggs and oil, added white chocolate chips and crushed peppermint candy. Baked for 10-11 minutes. WOW!! A great holiday treat! Those sound AMAZING Tina!!! So glad you enjoyed the recipe – I need to try these peppermint ones! Could I use this same recipe for the box muffin mix? I’ve never tried it because I never even thought of that!!! Now I want to try it! Blueberry cookies, or lemon poppyseed cookies sound delightful! Let me know if you try it and how it works out! Hi can you use olive oil instead of vegetable oil? I’ve never tried it but I wouldn’t recommend it. Olive oil will definitely affect the taste and even the texture but if you decide to try it, let me know how they turn out! I love these cookies I also roll them in powdered sugar it shows the cracks & I like how quick they are that way when I know someone is coming I whip some up real quick & it makes the house smell good before they get here! Your comment made me want to start baking! I love the smell of fresh cookies from the oven!!! YUM! My family loves lemon cake mix with white chocolate chips. 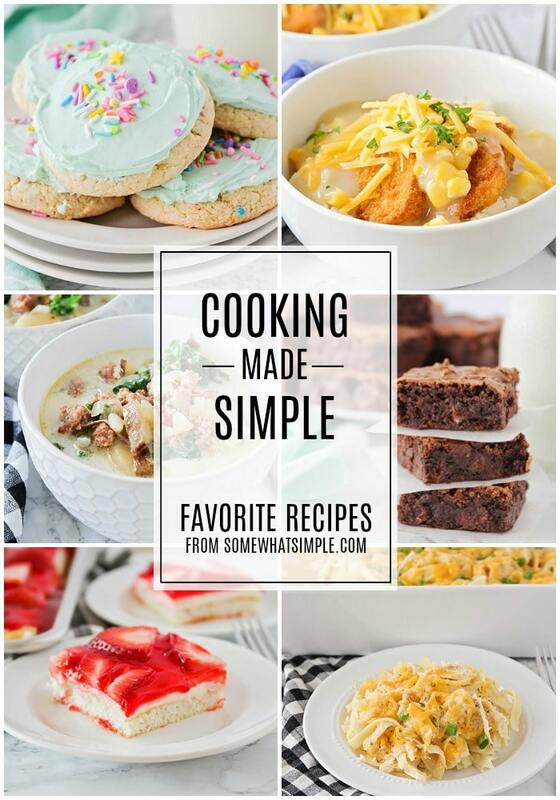 I love they are so quick and easy!…….and taste so good. That sounds AMAZING! I will have to try that! YUM! I am so glad they turned out yummy for you! Thanks for stopping by! I am definitely trying this recipe thank you for sharing! What is your frosting recipe!! 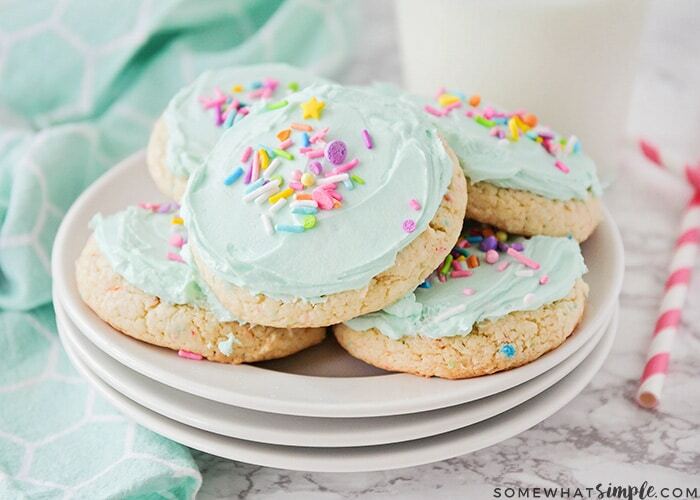 The frosting looks so perfect on top of these cookies! would this recipe work with sugar free cake mixes? I am a diabetic and am always looking for something new to try. Thanks. I’ve never tried it, but if you do I would LOVE to hear how they turn out! I was excited to click this and see because I thought “that is impossible” and I was right but I guess it all depends on perspective. 3 ingredients would be flour, eggs and sugar. The cake mix alone has over 20 ingredients in it so I don’t think it qualifies as “only 3 ingredients”. Another variation is use orange cake mix and add some orange zest. Oh so good! I have made these and although they were good…… they didn’t quite turn our nice and round like the ones in your picture. That is frustrating! I hate when something doesn’t turn out like the picture!!! The only thing I can think of is that I never flatten them out- I just drop them on the cookie sheet in round balls. Cookies would be great for an 8 hour drive- I’ll keep my fingers crossed for you!! 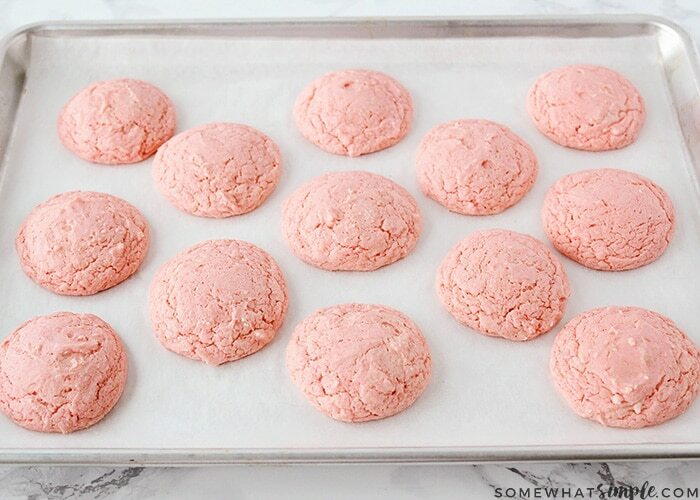 Try half strawberry and half lemon for strawberry lemonade cookies. They’re my daughter’s favorite! YUM! I am going to try that for sure! Thanks for stopping by! My cookies didn’t turn out like this at all. 🙁 They didn’t flatten very much. Disappointed with appearance. I am taking them to work tomorrow morning and will see how they taste. Bummer! Sorry they didn’t turn out- that is frustrating! These are for my 2 month old grandson’s sip n see tomorrow. Hope everyone likes them! I hope they liked them! Thanks for visiting our site! Random question, I know this calls for oil — but would I still be able to use butter instead? Has anyone tried that? Thanks so much. I’ve never tried it! Let me know if you give it a shot- I’d love to hear how they turn out! I have been making these for over 30 years. They are always a hit. My family has 3 favorites: chocolate with mini chocolate chips rolled in powdered sugar before baking, french vanilla rolled in sugar and cinnamon before baking and lemon rolled in powdered sugar before baking. I think I have tried every flavor of cake mix there is and they are all great. Aren’t they so great!? I need to try the mini chocolate chips- that sounds yummy! That is one of my favorite ways to make them! I would like to make these for my sister in law she can’t have gluten or dairy. Do you have other suggestions? I use 2 eggs and 1/2 cup of coconut oil for 10 minutes, my love them! I should try coconut oil- that sounds great! Since I learned about these a couple if years ago, it is the only way to make cookies. At Christmas I also use food coloring to match the holiday. Aren’t they great? So easy and nearly impossible to mess up! Just made these yesterday as Strawberry Crinkle cookies. I chilled the dough, scooped out into balls, rolled in powdered sugar and regular sugar. Baked for 15 mins …. nice little puffs of strawberry cookies! Very Sweet! I call these Cake Box Cookies. Have been making them for years now. Other than Chocolate Chip, these are the next most popular cookies I make. I suggest you chill the dough for a couple hours first. I then use a tablespoon (sometimes a teaspoon) to scoop out the dough, roll it like a meatball, then use two (2) fingers to push down dough like a pound sign (#). Bakes perfect everytime! Thanks for the tips Barbara! I am going to try chilling the dough the next time I make them! Another way to make these & avoid eggs/oil, is 1 box of white cake mix, 1 can of pumpkin, & chocolate chips. They are delicious, soft, & moist. Yep- I LOVE those cookies! I make them with a spice cake mix instead of white, but I think I will try the white box next! When placing the balls in the cookie sheet do I need to flatten it with a fork or will it.do it on its own in the oven? Thanks! I don’t flatten them at all. That’s a clever cheat trick! Could totally do that as gifts or party desserts! I cannot wait to try theses. Most cookies have butter in them, and I’m lactose intolerant. I know some mixes have milk or butter in them but less ingredients.. Less the stress! Thanks for sharing!! Thanks for stopping by Tessa! While I will still possibly make these for a bake sale, because sadly I just can’t afford to use my nice organic ingredients on something that large scale, I do agree in your frustration about three ingredients. I always dislike going through Pinterest and finding recipes claiming “3” or “5” ingredients only to find out that one is prepackaged and full of TONS of ingredients. Gah. Do you gave a recipe for brownie cookies? I have brownie mix. How many cookies can I expect to get from one box/batter? And, is this count based on a certain sized “glob” (as you stated) or are they drop cookies? Hmmmm, I don’t have a cake mix on-hand right now to double check, but I thought each box was pretty standard. I wouldn’t add more flour if I were you- just give it a shot as is and I think you should be ok.
Just found your site – looks great will have to check back on it when more time – but thought I would tell you that Betty Crocker super moist pudding in mix is 16.25 and Betty Crocker pudding in mix Super fudge is 15.25. Maybe another brand has a bit more. But I have used the pudding in mix for cake mix cookies for a while and *never* thought about looking at the weight of the box and they came out fine. I didn’t look because like you thought they were all pretty standard – guess I will start checking. But the cookies I have made turned out fine but mine always have goodies like chips, fruit or something in them which make up for the difference??? Make a test batch if the question arises again – that is what I do with about everything because some recipes are definitely affected by living in different parts of Alaska as I have for all these years. Thanks for the page! I’ve had this same issue! I had been making these for years, but I noticed last Christmas they just weren’t turning out right. Finally, I checked the box and yup, 15.25 oz. I went on a hunt for bigger boxes. Even had friends and family checking for generics at local stores. The Save-a-lot brand was 18.4 oz until just recently. Now I’m stuck again. So sad bc these were always a huge hit. And they just aren’t the same despite the adjustments I’ve been trying. Do the cookie sheets need to be greased? Thanks Pat! We appreciate you stopping by! Unfortunately Cool Whip IS oil but it is all hydrogenated oil which is a bit extra bad for you. Hi, I tried the butter pecan and added finely chopped pecans-they were soooo good…. Those sound delicious! Definitely trying that! Thanks for stopping by, Linda! Try adding peanut butter chips to your chocolate cookie batter…….super yum!! Oh yum! I’ll have to try that! Thanks, J.C.! I made these a few years ago for a community Christmas party using Lemon Cake Mix. Everything there was Chocolate, Chocolate and more Chocolate! My cookies were a hit because they took away the sweet taste from eating so many chocolate sweets! I’ve also drizzled into Chocolate Cake mix alittle melted peanut butter! Fantastic! That sounds amazing! Great tips 😉 Thanks for stopping by, Ellen! Would red velvet cake mix work? Ooh! Red velvet cookies♥ with cream cheese frosting..
I’m sure that will work and yield yummy results! I’m sure it would, Angela 🙂 That sounds SO yummy! Frosting from the above description sounds exactly like butter icing. I am definitely going to give them a go. These look so good!! They are so easy too. Perfect for someone like me who doesn’t really like to bake. Hi, I live in the UK. Could you tell me what 1/3 c means in ml please and also, what is frosting? Is it icing? Thanks, these cookies look great I am looking forward to making them with my little ones. Caroline,Frosting is thicker than icing in America. Icing sugar,butter,vanilla extract and moistened with milk or hot water.With icing you can it is drizzled over baked goods and you can see the baked good through it.Frosting is so thick it must be applied with a knife or spatula or piped on with a decorating bag.Frosting should not be confused with Fondant. Can gluten free cake mix be used? Just baked some with Chocolate Fudge cake mix, rolled in powdered sugar. Oh my gosh!! So good!! Fluffy, and light. These will go great with ice cream. I live in Denver, not sure if the altitude makes a difference on bake time. I baked mine for 9 min, then 3 more. Perfect!! Definitely gonna try these. I am all for easy and yummy at the same time. Thanks Donna, we hope you like them! Maybe you could try replacing the egg with applesauce. I’m not sure if the final consistency after baking would come out right.. I use yoghurt as an egg replacement. Double cream or Greek yoghurt works best; but any variant will do. Is this soft cookies or crispy cookies? Thanks.. These cookies are extremely soft! Can I use coconut oil or avocado oil instead of vegetable oil? I have never tried it, but let me know if it you give it a shot and if it works! It works, I use this recipe with coconut oil many times now and always comes out delicious! Good to know! Thanks Renee! Love these! They are so fun and so easy…great to make with the kiddos! Thanks for sharing, Stephanie! Thanks Kristi! I appreciate you stopping by and leaving a comment! Hope you’re doing well! It’ll work with any cake mix. Give it a try. These look so yummy and I love how EASY they are. 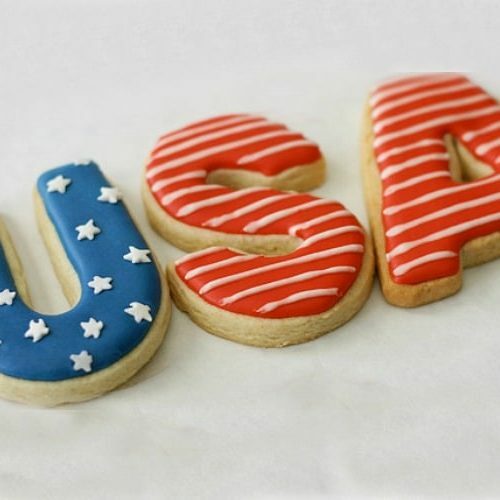 Cake mix for cookies – love it! I have a recipe for Lemon Cake Mix Cookies using a box of lemon cake mix, 2 eggs, 1 Tbs oil and 4 oz Cool Whip. Tres Yummy. These sound good though too! These cookies are so adorns and cool and plus they really bring the holiday cheer especially around X-mad Time. Thanks so much! I am glad you like them! Do you have carb count? To find the carb count, look at your box of cake mix. Multiply the servings per container (mine is 10) by the carbs per serving (mine is 35). My cake mix has a total of 350 grams of carbs. Divide that by the number of cookies you make, and you will know the carbs per cookie. (Oil and eggs are both carb free ingredients.) One dozen cookies would be 29 grams of carbs per cookie. If you make 2 dozen small cookies, they would be 15 grams each (with the example number I used). I commented before I made the cookies. I got 35 cookies out of one cake mix, so 10 grams of carbs each. If you add any other ingredients (powdered sugar, chocolate chips, etc. ), it would, of course, change the carbs. Thanks for your help Lisa, this was very helpful!